Dr. Carlos Boudet, aided by Dental Assisting student Ashley LaBlanc, treats a patient at Free Dentistry Day on the Lake Worth campus. The second annual Free Dentistry Day on April 27 brought relief to 40 low-income adults who had put off dental treatment due to the cost. Dentists affiliated with Atlantic Coast Dental Research Clinic, aided by Palm Beach State Dental Health students, started seeing patients at 8 a.m., but people were in line as early as 4:30 a.m. for the free first-come, first-served treatment. The day didn’t end until 6 p.m. Dental Assisting student Shelby Pelz with patient Robin Remillard. Their efforts focused on getting people out of pain, not general check-ups. PBSC students aided 15 dentists in performing 32 extractions, 33 fillings, and one pulpotomy, which is the first step in root canal treatment. Six Dental Hygiene students took patients’ vital signs, and 18 Dental Assisting students took over from there, obtaining each patient’s medical history, doing dental x-rays and assisting the dentists at chairside. 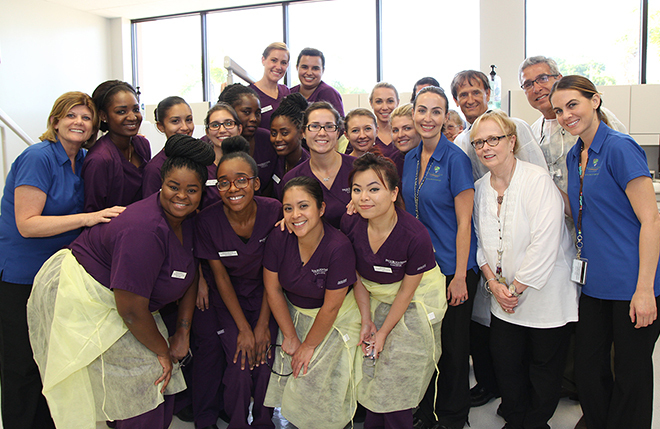 All smiles: Dental Assisting students and other team members at the end of a great day. Dr. Carlos Boudet, board member of ACDRC, recruited the volunteer dentists, but like Bradshaw, he gives credit to the entire team.